Is This The First Wrecked 2015 Ford Mustang? Well, that didn't take long. The 2015 Ford Mustang has just started hitting dealer lots, and already at least one of them has been completely trashed. This yellow one may just be the first, but — let's be honest — certainly not the last. 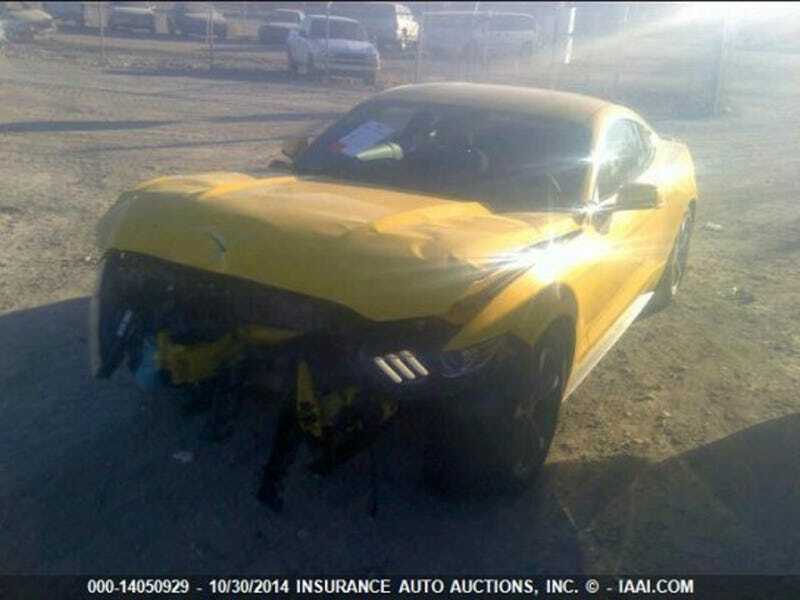 Carscoops dug up a listing on the Wichita, Kansas auction site IAAI for this 2015 V6 Mustang with just 469 miles on the odometer and a very, very wrecked front end. Apparently it still starts, though, and that's always a good thing. Other than that we don't know much about this car or what happened to it. A post on the Mustang6G forum indicates it may have been crashed in Dallas. The airbags also didn't go off despite the damage. No word yet on when it will be auctioned or for how much. Any takers?